Foss Fine Art is excited to present British Contemporary Prints, an exhibition produced in conjunction with Dark Matter Studio. The exhibition will showcase significant works in print produced by Dark Matter Studio for artists as varied as Peter Blake, Gerard Hemsworth, Liliane Lijn and Steve Thomas, together with relative new comer Mary Yacoob. 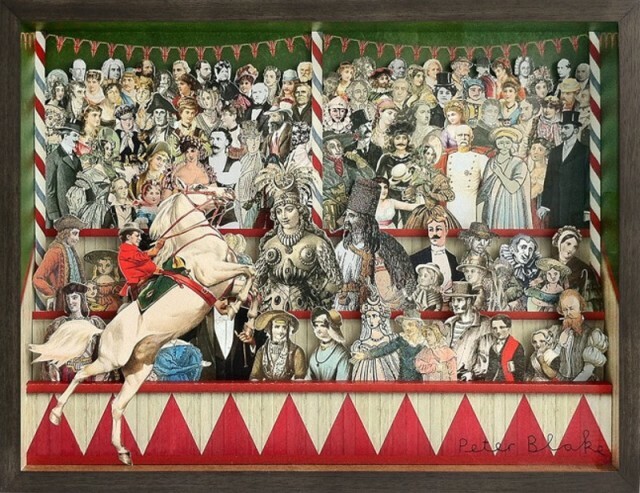 A pioneer of Pop Art, Peter Blake continues to develop his varied practice towards ever more ambitious projects. Now in his 80’s, his enthusiasm for colour, collage and popular culture is clearly evident in a new series entitled the Four Seasons that playfully illustrates the cultural characteristics and associations associated with Spring, Summer, Autumn and Winter. Also available to view will be Blake’s Tattooed People series, a print edition of ten watercolours depicting fictional tattooed characters based on found photographs. Continuing with the defiantly glorious aesthetic of the fairground, Blake’s Tiny Tina the Tattooed Lady will also be on show. In contrast, Picnic Triptych by Gerard Hemsworth displays a pared back approach to colour. Originally commissioned to accompany Hemsworth’s 2015 solo exhibition at Matt’s Gallery, the edition represents landscapes that have been simplified to almost cartoonish forms. Despite this apparent simplicity, the works retain a sophisticated subtlety suggested through line and colour. Until 2011 Hemsworth was Professor of Fine Art and Director of the MFA Fine Art Programme at Goldsmiths, University of London. In 2000 he won the Charles Wollaston Award at the Royal Academy of Arts. Liliane Lijn’s five Winning Words editions are based on Lijn’s Oracular Keys, a set of cards created in 1964 for the first staging of her Power Game performance, at the Royal College of Art. In each edition the winning words from one of the five public performances are presented in their original colours, while the losing words from each are greyed off. Following on from the performances, the viewer is encouraged to assess the power and relative values of various words, each with their connotations and insinuations. Steve Thomas is well known for his ground-breaking design of the ultra-hip Big Biba store in in the 60’s. Thomas’ works presented in the exhibition contain familiar visual references, iconic patterns and forms. Drenched in colour they act almost like retro-futuristic signs from a long forgotten alien race. Recently interviewed for BBC Radio 4 by Jim Moir (AKA Vic Reeves), Thomas has also produced sleeve art for the Rolling Stones and the Pixies to name but a few. Mary Yacoob appropriates symbolic visual grammars from architectural plans, geological maps, diagrams, and alphabets. Yacoob’s print, Modula Hakka House, is of a drawing that has two inspirations: the first is a floor plan of a 17th Century Hakka walled village in Southern China – a communal living structure that is designed to be easily defensible; the second inspiration is the modernist architect Le Corbusier’s Modulor system for universal harmonious proportions for urban design.